One of the biggest challenge of booth based voting system is that a voter has to be physically present to vote. This leads to low voter turnout. With Right2Vote platform a voter can vote from anywhere directly from his mobile. There is no need for him to be physically present at the booth the vote. Right2Vote platform provides real-time results for all polls. There is no requirement of physical counting of votes and the complete voting process happens without any manual intervention. However, the platform also provide options of result counting to happen only after close of poll when all voters have already voted. 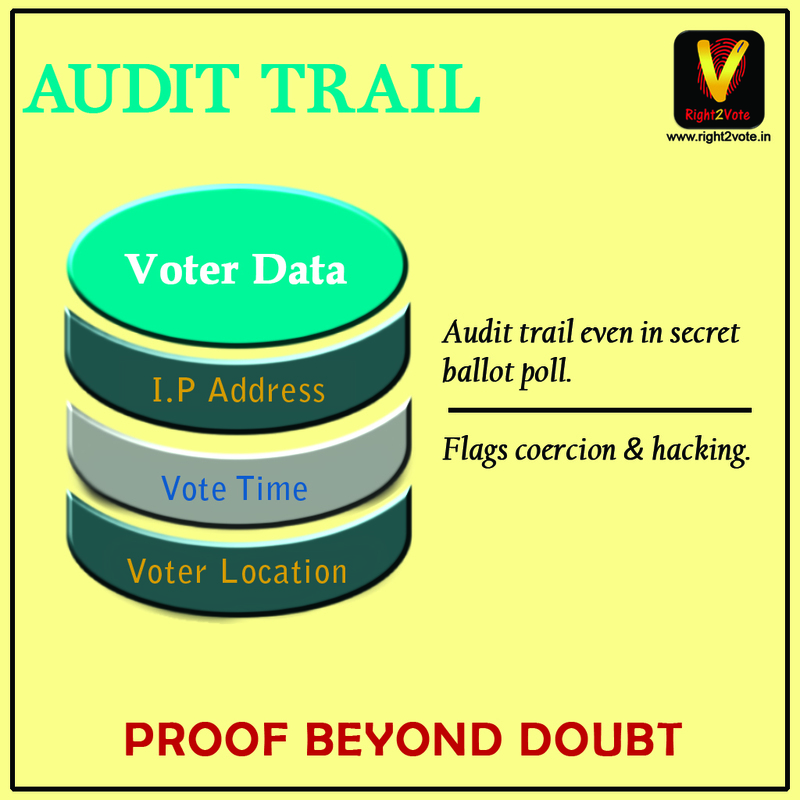 Aadhaar based verification is a functionality by which we can verify the voter voting remotely in real time. 3.Mobile OTP: before giving access to voter of the voting page, a One Time Password (OTP) is sent to the mobile number which is registered with the Aadhaar number against the name of the voter in the Aadhaar database. Voting is effective only when its done in a closed predefined group. It is very important that your voter list represents all otherwise voting can’t give right results. With Right2Vote you can predefine who is allowed to vote and who is not allowed. Only people allowed to vote, would get access to poll. Secret Ballot is a function where individual voter’s vote details is not available to anybody including the election managers and the IT team managing the platform. This ensures the voter can vote without any fear. This is specifically helpful where election management is in hands of one of the contestants. Example: If a dictator of a country is holding a referendum on himself, citizens of that country would be very scared to vote against him. With assurance of #SecretBallot, voters can vote fearlessly. Geo tagging is a functionality where along with vote geographical location of the voter at the time of voting is recorded. This is specifically very helpful when the poll manager want’s to understand to evaluate the variation in voting pattern across different geographies. Example: If a poll is happening on popularity of different sports, Cricket would appear very popular due to number of votes. However, if geographical concentration of votes are considered it would be clear that majority of votes are coming from Indian sub-continent. Geo-Fencing is a functionality where we can restrict voters from certain geographical areas only to be able to vote. People outside that geographical area would not be able to vote. Example: In 2014, Mr. Arvind Kejriwal, Chief Minister of Delhi asked for opinion of Delhi citizen whether he should continue as CM or resign. People across the country and the world ended up voting in that poll leading to misleading results. With Geo-Fencing function, we can restrict voter outside the geography (in this case Delhi) from participating in the poll. Allow nomination is a functionality where voter is given opportunity to suggest option other than the one listed by the poll managers. In this case if a voter nominates a new option, all subsequent voters would also see the new option in the list and would be able to vote on the new option. For example: If the HR of the organization has nominated 4 names for the award of “employee of the year” award, each employee would have the choice to nominate himself or somebody else for that award. This would make the award more fair. The New Companies Act 2013, makes it mandatory for all listed company to provide eVoting facility to it’s shareholder to vote on resolutions in Annual General Meeting (AGM). Generally AGMs are held in one city and shareholders are spread across the country and the world. This helps shareholders to participate remotely and helps in minority right protection. Shareholder voting is different from general voting because unlike general voting, in shareholder voting each person does not have equal vote, each share has a vote. Each shareholder has number of voters, equal to the number of shares he holds, and he can divide his vote in favor, against or stay neutral in the same resolution. Single Transferable Vote (STV) is method of counting used in ‘Proportional Representation’ method of election. Its a very complex system of voting where each voter get only one vote and he is supposed to rank the candidates. One or more than one winner is selected based on candidates getting maximum first preference plus transferred votes. Votes of Candidate who gets least votes are transferred to other candidates based on second and subsequent preference. President of India, Rajya Sabha, CA Insititute, Bar council and several such elections use STV method of vote counting. Such counting generally take thousands of man hours. With Right2Vote platform even STV counting happens in almost real-time. In any important voting, generally the losing party cries foul and blames the system. Hence, its important to provide facility where system can establish the total flow of votes – starting with the voter to the end result to establish that the whole process has been fair. However, important election also requires secret ballot so that voter is able to vote fearlessly and nobody should be able to know his individual vote. 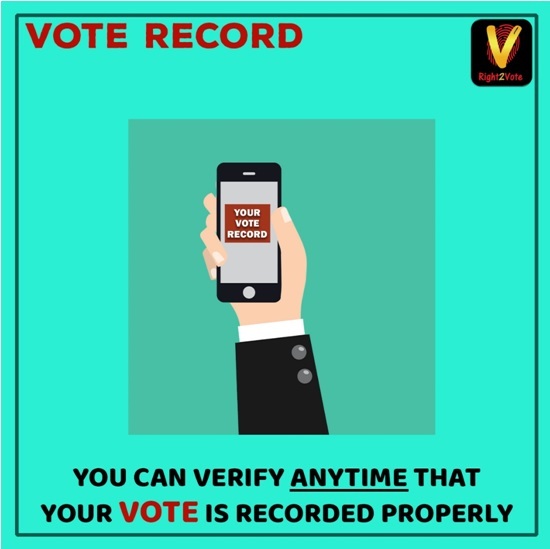 Right2Vote platform has been able to provide these two mutually exclusive function together on this platform with smart use of Aadhaar and Encryption. In Right2Vote platform, the poll creator has full rights to decide the result visibility. He can decide the results to be visible to all including the voters. Or he can decide that results would be visible to him only. He can also decide that result would be computed only after the conclusion of the poll and then would be visible to everybody. In Right2Vote platform, the poll creator has full rights to decide the result calculation timing. In certain sensitive polls like National elections, professional elections etc., polling trend is a sensitive information and its better to calculate the result only after poll close. Allow vote change feature allows the voter to change his vote anytime before the close of the poll. This feature is very useful where a voter is expected to change his opinion due to happening of certain event. For example, audience of a debate might have different opinion on a subject before the debate and might change their opinion after hearing the debate. This feature is also a very useful feature where there is a risk of coercion. If the voter was forced to vote against his wishes, whenever he is in private space, he can change his vote. In certain polls audience engagement is more important than equal voting right. For example – Television shows like Indian Idol, Big Boss etc. In such shows, the show managers allows the audience to vote more than once for their favorite candidates. The more a candidate is able to engage his fan base, better his chances of winning. Allow multiple votes feature is for such polls. In a country like India where many people are not literate and where different sections of people are comfortable with different languages, picture is the only universal language. Not all polls are simple one question poll. Right2Vote allows you to create polls with multiple questions. Everybody has groups in which they regularly interact. Right2Vote provides facility to store your groups. This saves you the effort of adding names each time you create a poll. Just select the group and invite them to vote. The platform provides personalized invite capability. At-times, sending personalized invite is not enough or people treat individual invites as privacy infringement. Also, at times you want to reach out to all your voter base at once. Or the candidate might like to reach out to his voter base. Poll start time and end time is one of the basic requirement of any poll. Right2Vote platform also allows you to create future dated polls or store polls in draft and publish it at an appropriate time. Any sensitive poll the security of the system is the first concern. Right2Vote provided end to end encryption which ensure 100% hacking proof platform. In a poll where there are more than one question, the voter can be provided the option of not answering one or more questions. This feature is useful where there is a risk that the voter might like to avoid voting on a specific uncomfortable question and might drop out from the poll to avoid that question. My Poll Invite screen lists down all polls where the user has been specifically invited. For this the poll creator has to input the voter’s mobile number. This ensures that no junk polls are shown to the voter. Another benefit of this page is that a voter need not search for links to polls in his mails, sms etc. Whenever he wants to vote, he just need to open the Right2Vote app. This screen is the landing screen and on this page he gets all the polls where he is supposed to vote listed at one place. Right2Vote ensures creating poll is a very easy and efficient process. Still poll creator who is creating similar polls might not like to do the whole thing again specifically loading picture which consumes more bandwidth and hence takes more time. Right2Vote platform offers the facility to copy the template of any previous poll and edit it to use it as a new poll. This saves time and effort for the poll creator. When you have created a poll, you can’t wait for your voters to vote. RIght2Vote platform provides you real-time information on who has voted and who is yet to vote. 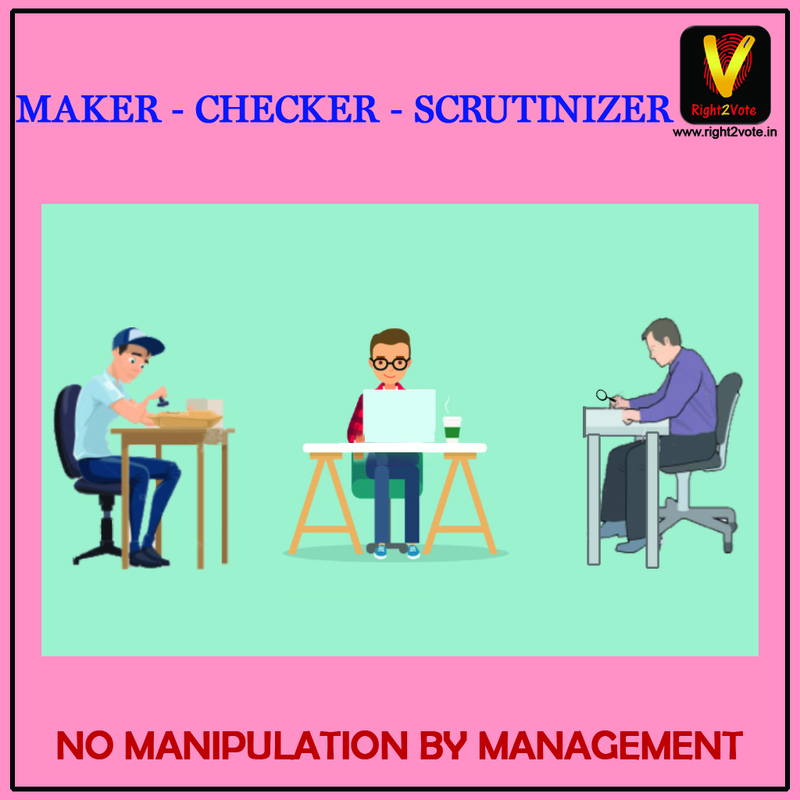 We have Maker – Checker – Scrutinizer features to ensure division of work and control. This would reduce the powers vested with the poll creator / maker. The maker has to get the poll approved from checker. Scrutinizer, who is generally an external professional of high reputation, gets to view and scrutinize the results. Remote voting has the challenge that somebody else might vote on behalf of voter. 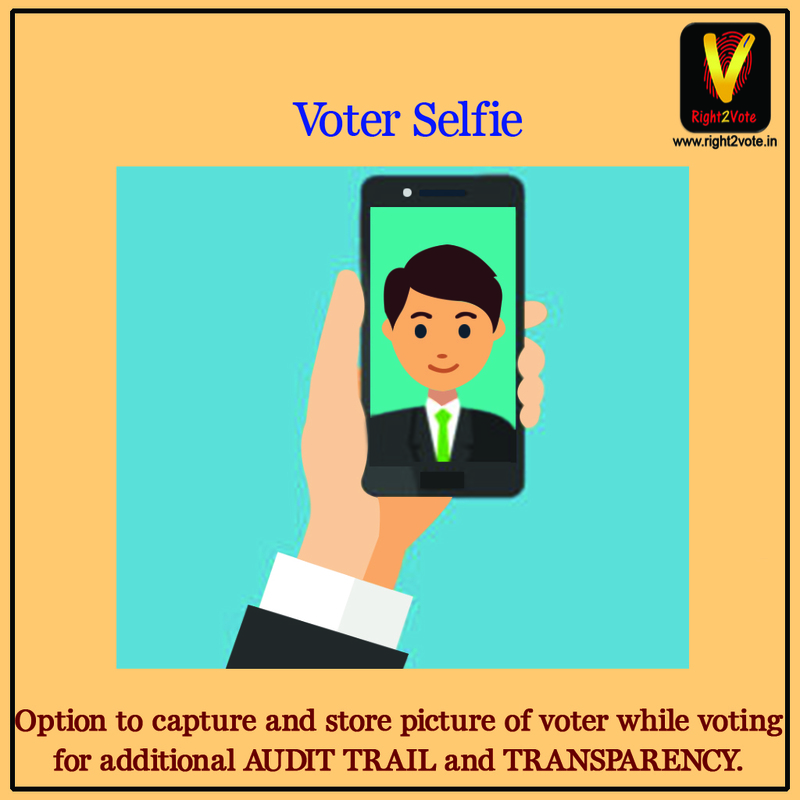 Voter selfie feature ensures the voter has to vote in person. 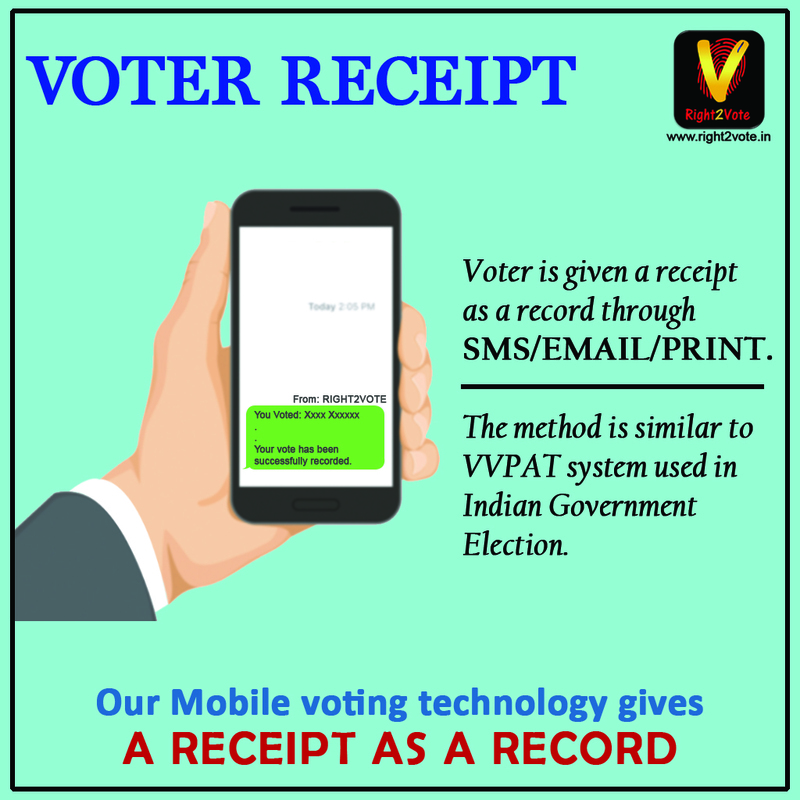 We provide voter a receipt with his vote information via SMS / EMAIL / PRINT. This gives the voter the confidence that vote has been recorded properly. Similar to VVPAT system, if accuracy of system is questioned, these receipts can be counted to prove the accuracy of the system. One of the perceived risk of online system is hacking – specially hacking while transit. There is a risk that vote data would be tampered with while the data flows from voter mobile to our central server. To eliminate this risk, we have built a feature where our server ask for confirmation from voter before his vote is recorded. Vote record in a superior feature than Voter Receipt as it provides vote record direct from the servers. Hence in case votes has been tampered with post voting, the voter would come to know. Transparency is the best antidote against malpractices. Generally one person has one vote. However, in certain voting including voting of creditors in insolvency cases, different voters have different weightages based on their investment or some other criteria. 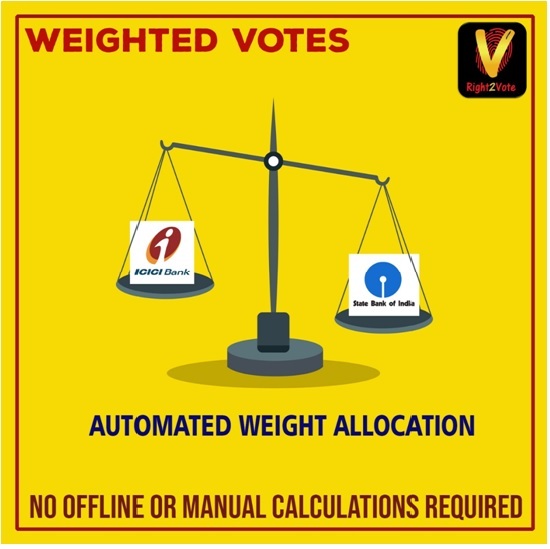 This feature ensure that the poll creator does not have to do offline weight allocation to votes which is a very tedious and error prone task.